The French, I think, must be world champions in the production of books lamenting the state of their economy (they are also good at taking antidepressants). Occasionally, it is true, someone writes a book to the effect that things are not so very bad in France, in fact that they are really quite good, at least by comparison with everywhere else; but this is so contrary to the majority of what is written that it has the quality of whistling in the wind. If the French economy had grown at the rate at which books are published predicting its imminent collapse, it would be flourishing indeed. Confined to bed in Paris for a few days by a case of flu, an economic jeremiad was just what I needed to pick me up. There is nothing quite like lamentation, I have found, to make one feel better in oneself. Tant pis! Nos enfants paieront (Too Bad! Our Children Will Pay), by FranÃ§ois Lenglet, was just what I needed. How can one complain about a few minor symptoms such as headache, fever, and cough when the whole world is going to the dogs? It is one of the theses of this lucid book that the generation of May 1968″or at any rate its leaders”has arranged things pretty well for itself, though disastrously for everyone else. If it has not been outright hypocritical, it has at least been superbly opportunist. First it bought property and accumulated other assets while inflation raged, paying back its debts at a fraction of their original value with depreciated money; then, having got its hands on the assets, it arranged for an economic policy of low inflation except in the value of its own assets. Moreover, it also arranged the best possible conditions for its retirement, in many cases unfunded by investment and paid for by those unfortunate enough to have come after them. They will have to work much longer, and if ever they reach the age of retirement, which might recede before them like a mirage in the desert, it will be under conditions much less generous than those enjoyed by current retirees. It matters little whether this was all part of a preconceived plan or things just fell out this way, for that is how things now are. The result is that what was always a class society is in the process of becoming a caste society, in which only children of the already well-off have a hope of owning their own house. M. Lenglet sees several reasons why the situation is particularly catastrophic in France. There is nothing like having been born, grown up, and lived in a country for seeing its weaknesses. It is the same with close relatives: One perceives in them all the little faults and defects that strangers do not notice, and understands the little barbs in their innocent-sounding statements that strangers miss. France is very near the point of incandescence, which could lead to a kind of civil war in which different interest groups confront one another, completely forgetting the common national interest. This is precisely what my French brother-in-law says, except that he does not put it in the conditional: The explosion is coming and cannot now be avoided. From my own observations, I find this not altogether credible. It is true that I inhabit a mainly bourgeois world in which services are still excellent, the quality of life is high, and most people do not have problems meeting their bills at the end of the month. Being myself one of the fortunate, or perhaps I should say parasitic, generation, I have nothing to do in Paris except go from interesting exhibition to interesting exhibition, eat in good restaurants, and go to the cinema (thanks to subsidies, Paris is by far the best place in the world to see films from the four corners of the world). Since the public transport is excellent, I don”t need a car, which would only be a liability there, and to be free of the ghastly contraption is a rare luxury in the modern world. This pleasant little life seems to be based upon such solid foundations that it could never founder. And yet I am perfectly aware that, not very far away, is another world entirely, indeed more than one other world: the Paris Metro. And the Gare du Nord is a good place to see it, or them. To begin with, quite a number of the stations of the Metro smell unmistakably of the homeless, far more than they ever did before. Whole families of beggars take up daytime residence in them, claiming to be Syrian refugees but really being gypsies (according to a Tunisian taxi driver to whom I spoke, who said that they knew not a word of Arabic apart from a phrase or two that their children are taught to intone). 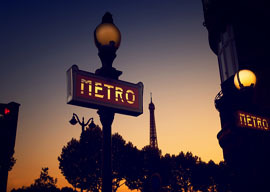 No doubt begging in the Paris Metro is a wretched way to live, but sympathy is far from an inexhaustible quality in most people, while irritation is not.